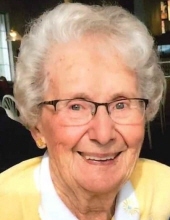 Loretta R Harris, 89 of Chippewa Falls WI passed away Thursday, June 7, 2018. She was born September 30, 1928 in Curtiss WI the daughter of the late Albert and Angeline (Burtard) Smith. Loretta was a member of Our Saviour’s Lutheran Church in Chippewa Falls, and was a very active member in the church’s quilting group. She also enjoyed the outdoors by spending her time golfing, snowmobiling, and fishing. She had a love for reading, but most of all Loretta loved spending time with her grandchildren, family and friends. Loretta was preceded in death by her parents; husband, Arlun Harris; daughter, grandchildren Nathan (Michelle) Nelson, Jenn (Matt) Solberg, Kyle Harris, Kimberly (Jason) Solberg, and Kurt (Stefanie) Harris; her great-grandchildren Kayli, Mitchel, James, Alexandria, Calvin, Mia and Luke; sister, Barbara (John) Serowski; and many nieces, nephews and friends. Gail Nelson and sister, Delores (Karl) Richter. A visitation will be held on Tuesday, June 12, 2018, from 10AM to 11AM, at Our Saviour’s Lutheran Church, 1300 Mansfield St, Chippewa Falls, WI. Memorial service to follow, with Pastor Jeanne Warner officiating. Interment private. "Email Address" would like to share the life celebration of Loretta Ruby Harris. Click on the "link" to go to share a favorite memory or leave a condolence message for the family.